Situated on the ground floor of the new Crossrail building, which itself sits on an artificial island in the middle of North Dock, on the northern edge of Canary Wharf, Notes is fairly easy to find once you know roughly where you’re going. If you’re familiar with the newer Notes, such as Moorgate and King’s Cross, it will hold no surprises in either look or feel. There are the floor-to-ceiling windows extending around two sides, plus tables on the pedestrian walkway outside. Although there’s not much of a view, they make a pleasant enough option when the weather’s nice, not really being sheltered enough when it’s raining. Inside, it’s bright and airy, with high, exposed ceiling. Midway between King’s Cross (smallest) and Moorgate (largest) in size, the cosy atmosphere’s more in keeping with King’s Cross than Moorgate. The shape is weird though, even by Notes’ recent standards, the floor plan bring to mind a croissant with a flat front edge (it’s long and thin, with a bulge in the middle). The flat edge, which runs along the southern edge of Crossrail Place, is all windows, the door about one third of the way along on left, opposite the bulge. There’s seating to the left, where the far end is also a window, with the bulk of the seating to your right. Ahead and to the right is an L-shaped island bench in the centre of the room, behind which is the counter. Initially slightly disorientating, it is in fact an incredibly clever use of the space, since it channels you to the left, which in turn leads you along the counter, past the cake, to the till. You then keep going past the twin espresso machines to collect your (takeout) coffee. If you’re staying in, grab a glass of water and head for your seat, which could include one of several window-bars, tables, benches or the island bench itself. If you do sit there, don’t worry about feeling as if everyone will be constantly walking around/past you (a frequent problem in coffee shops). The seating is cleverly screened from the counter, making it a delightful spot. I’d popped into Notes for breakfast, having surprisingly found myself in Canary Wharf first thing in the morning. Naturally, I chose a flat white to start my day and was rewarded with a rather fruity, punchy drink which left me feeling that I’d probably find the espresso, on its own, a little too much for my palate. In milk, however, it was ideal. If I have one slight criticism of Notes is that it’s quite hard to see what coffee is on espresso or in the bulk-brew filter (no pour-over options here). Although the branch in Canary Wharf station has a board explaining which beans are on, I looked around in vain for one here or at King’s Cross. With that in mind, I believe I had the San Juan espresso, a single-origin (Notes only roasts single-origins) from Guatemala, but I’m not 100% sure. I paired this with some very fine and crunchy sour-dough toast, served with a couple of packets of butter. However, the jam, rather than coming in an undersized pot, as is often the case, arrived in a huge dollop on a little saucer, something of which I heartily approve. This entry was posted in Breakfast, Cafe/Roaster, Cafes, Cake, Coffee & Beer, Coffee & Wine, Coffee Terraces, Dinner, East London, Evening Opening, Laptop Friendly, Late Opening, Lunch, Sandwiches, Stations Nearby and tagged include, Notes by Brian Williams. Bookmark the permalink. I think He’s talking about Taylor St Baristas. 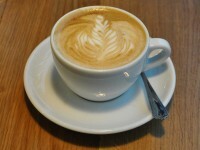 BTW I tried the above place on the 16th December & found the coffee there (Flat White) to be excellent. Notes also have a Takeaway in Canary Wharf Tube station, Taylor Street Baristas also have a smaller place next door to Barclays which was queuing out the door at 3.30pm that afternoon. That was good too but the milk could’ve been warmer. Canary Wharf could do with more 3rd wave coffee shops from what I’ve seen. Funny you should mention the one in Canary Wharf station; I’ve just come out from there. Great coffee. The reason I ended up in Crossrail Place when I did was because Taylor Street Baristas was queuing out of the door, as was Notes in Canary Wharf. There’s also a TSB in South Quay, but I suspect the area could support more speciality coffee.